Located in the Students menu, using student groups are an efficient method for managing whole classes rather than individual students. 1. Select “Settings” > “Student Groups” menu. 2. Select “Add group1” button. 3. 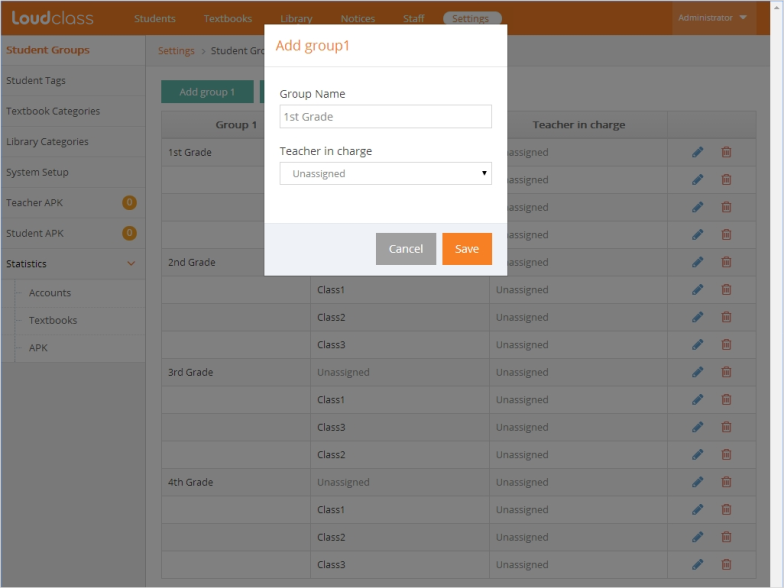 Enter a name in “Group name” and select a teacher to manage the group in “Teacher in charge” option. Note : Group1 name is the primary group name that should correspond to how the organization groups students. For example, 1st grade or 2nd grade. 4. Select “Save” to save the Group1 setting. 5. Select “Add Group2” button. 6. Enter the secondary group name and select the primary group in “Select Group1” option. 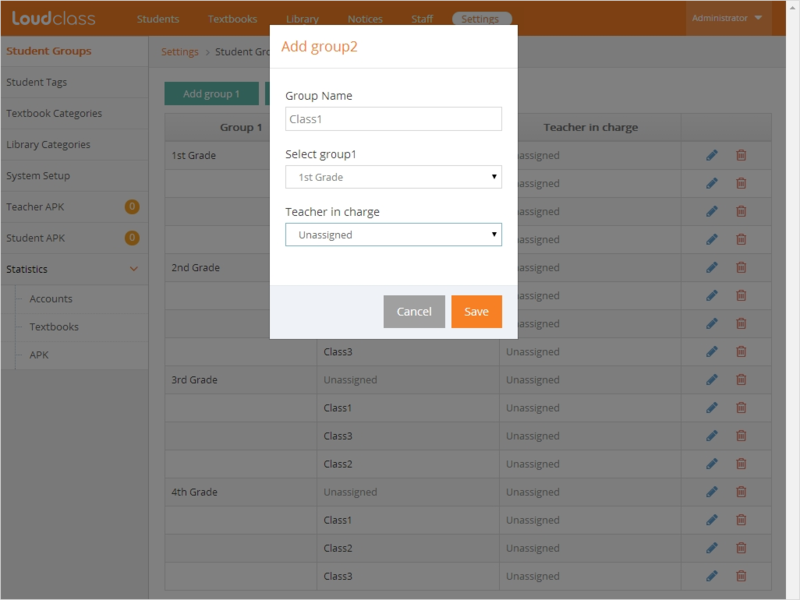 Select a teacher to manage the group in “Teacher in charge” option. Note : The Group2 name is a secondary group corresponding to class1 or class2. 7. Select the “Save” button to save Group2 as a sub-group of Group1. Note : The groups are sorted alphabetically. Tip : It will be easier to manage or assign students if the groups are based on the organization’s actual class plan. “Teacher in charge” is an additional role assigned to class management staff. The role grants authority to modify student information. It’s an optional setting but allows non-student management staff to easily modify student information. The teacher in charge of Group1 (primary group) has the authority to modify the information of the students assigned in all of its secondary groups and the teacher in charge of Group2 (secondary group) has the authority to modify the information of only that group. 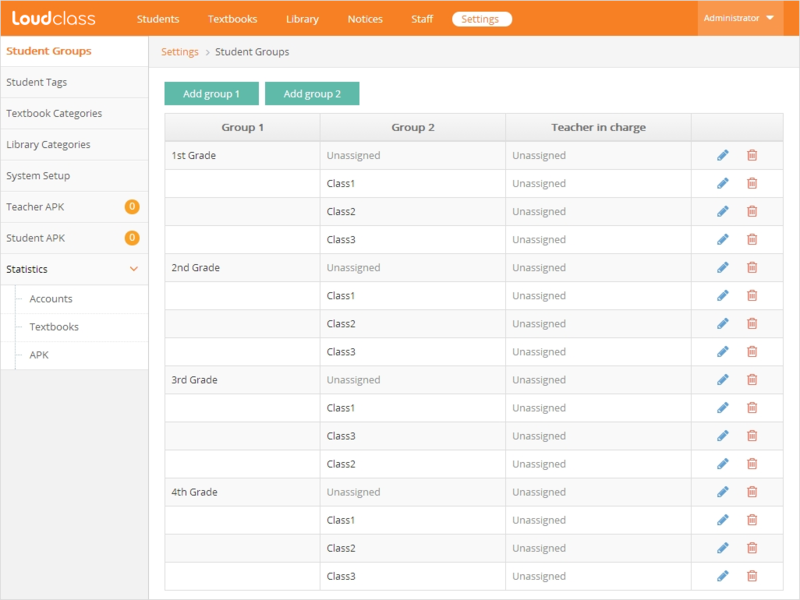 If Group1 (primary group) is deleted, Group2 (secondary group) is also deleted and the students assigned to group2 move to an “Unassigned” status under the group. In case of deleting Group2, all the assigned students move to Group1 > Unassigned.